I cannot believe it is already the New Year, and the second week no less! Time really does fly. Especially when I spent so much of the holidays eating, eating and more eating. 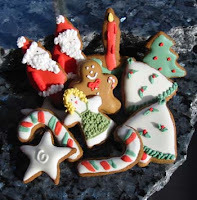 I hope all of you also had wonderful holidays full of cheer, friends, family and delectable goodies. Now, in keeping with food, I'm in the midst of writing a piece about cooking for City Palate magazine. Yes, me. Laughable I know. I mean, I can make the basics and keep myself alive (good thing since Jason is working out of town this month), and I do have a couple of dishes that I make fairly well, but I am by no means a cook. Not even the lowly deep-frying, burger-slinging kind. I get all nervous and indecisive in the kitchen. And I just don't enjoy cooking. It's so much work! But I do love to eat (in case you didn't pick that up already), and I recognize that cooking my own meals is often less expensive and healthier than eating out. I also realize that I should be a good mom and at least equip Annabel with some life skills to sustain herself. Given she's only a year old, I have a few years before this will really come into play. I only hope that will be enough time given my cooking track record, or lack thereof. Plus, as I discovered while researching a story for Canadian Living, I want to cook with her because it will teach her a lot more than just how to cook. Anyhoo, have a read while I try to concoct something edible for lunch. That was awesome Colleen. I still remember my Dad teaching me to bake my first cake when I was 6. He was the baker in the family and it was a rite of passage that you learned to bake at 6. To be honest, all I can remember is him saying "Never bang metal on metal", meaning don't hit the medal bowl with the metal beater to try and get the dough off it; use a spatula.